The UnCovering of the Relics of the Monk Makarii of Kalyazinsk occurred on 26 May 1521. A merchant from the city of Dmitrov, Mikhail Voronkov, offered the means for the construction of a stone church, in place of the decaying wooden one, at the Kalyazinsk monastery. The hegumen of the monastery, Joasaph, set up a cross designated for the altar, and gave blessing to dig the trench for the foundation. During the time of work there was discovered an undestroyed grave, from which they issued forth a fragrance. Hegumen Joasaph immediately recognised the grave of the founder of the monastery – the Monk Makarii, gone to rest in the year 1483. The brethren of the monastery and a crowd of gathered people made a panikhida over the transfer of the grave to the church. From this day the undecayed relics of the saint began to work healings. A report about this was made to the Metropolitan of Moscow, Daniel (1522-1539), who convened at Moscow a Sobor (Council) and, having examined in detail testimony about the sanctity of the Monk Makarii, he established a feastday to the newly-appeared saint. The relics were solemnly transferred to a temple in the Name of the Holy Trinity. 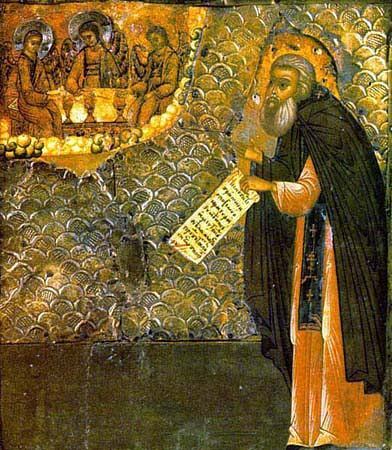 Feodosii of Tver' was the compiler of the Service for the UnCovering of the Relics. Until 1547 the veneration of Saint Makarii was done only at this monastery. During the Moscow Sobor of 1547, under Metropolitan Makarii (1543-1564), the Monk Makarii of Kalyazinsk was enumerated to the rank of the Saints, and his memory set on the list of other Russian Saints to be celebrated throughout all of Russia. An account about the Monk Makarii of Kalyazinsk is located also under 17 March, on the day in memory of the repose of the saint.